WE love G.O.O.D Music! & not just that mainstream music either! We love... anything really & from anyone too! If it sounds GOOD, we'll plug it (plug = spread the word lol)! We aim to bring 2 U G.O.O.D music that radio doesn’t play... that U won't hear anywhere! I’m almost livid at myself for not immediately recognizing the amazing talent oozing out of Benjamin Francis Leftwich until my 14 year-old sister pointed it out. But for what it’s worth, I’m glad I listened. 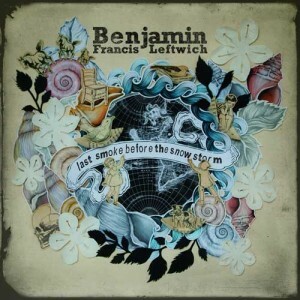 I plug to you 21-year old singer/songwriter Benjamin Francis Leftwich a native from York, England. I find it interesting that Leftwich has decided to be known by his full name in a case where most artists tend to shorten their legal names or more often than not, alternatively come up with a catchy stage name. Leftwich grew up listening to artists such as The Rolling Stones and Nina Simone and by the tender age of 10, unsurprisingly could play the guitar and piano. Fast-forward to more recent years and a drive to pursue his musical talent, Leftwich released his first EP A Million Miles Hit in October 2010. Another EP Pictures followed in early 2011 before the release of the the Ian Grimble-produced Last Smoke before the Snowstorm; his debut album in July 2011. The debut album and previous EPs were all released under the Dirty Hit label. Asides releasing his own music over the years, Leftwich is also known for his several radio appearances on Dermot O'Leary’s Saturday Sessions on BBC Radio 2 and co-writing a hit song for Pop group Cascada. His 10-track debut album steers straight towards the Folk music genre, seamlessly blending to make for a great Summery soundtrack. When asked by BBC Radio 1 about his plans for the rest of his career, he simply said “I want to keep playing music and being happy with what I'm writing. I'd like to be in a house in the Lake District in 18 months time writing album two". Now we delve into the musical world of Benjamin Leftwich and what he attests are his pick of songs he's been working on for up to four years that come together perfectly on one record. The first track I plug to you is the third track from the album titled "1904". The record starts off with an organ sound for the first 20 seconds before an acoustic guitar riff is heard playing, forming what would be the baseline for the track. Leftwich’s somewhat raspy and mellow voice laces the very minimalistic instrumental accompanied with soft harmonies categorizing this track somewhere between Folk and acoustic Pop music. The standout feature on this song has to be it's chorus which is then followed by a violin solo orchestrated so perfectly, it sounds like something out of a movie that you never want to end. On this song, Leftwich sings about a time in his past and how he’s grown from then to now with changes ‘she’ should notice - almost sounding like he needs a sort of acknowledgement. A more upbeat turn to Leftwich’s sound can be heard on our third and final plug - a song titled "Atlas Hands". A joining of multiple stringed instruments make up the complete sound effects on this while on backing vocals, we hear a female voice that meshes well with Leftwich’s soft spoken and almost angelic voice. On "Atlas Hands", Leftwich sings beautifully about an unexpected romance that blossoms into much more between two people who are seemingly based in different parts of the world with lyrics such as, “the stars are the only thing we share”. I especially like the mellow appeal of the track with its soothing guitar strings and I almost feel there should be a second part to the song - maybe on his second album - as this Pop Folk track makes for a really great listen. Listening to this album poses no confusion as to what kind of music Leftwich intended to make and put out for his audience. He sticks to one unique style throughout most of the album with vocals ranging at the same pitch creating somewhat of a homogeneous sound which sometimes leaves a longing to hear something different. However, he has nicely packaged a product that is sure to do well both now and in the future. Nevertheless, this 32-minute 10-track album in its entirety is a solid debut and body of work. Last Smoke Before The Storm is filled with other standout tracks such as "Stole You Away" and "Box of Stones" which was the first released single off the album - it made its way to number 24 on the UK Indie chart. If you like what you hear and are in the UK in search of a GOOD music concert, be sure to check out when Leftwich will be in your city because he is currently on tour. What do You Call It? G.O.O.D.M.U.S.I.C.